Do you have a space in your home that you can clean as your own? Perhaps it’s a favorite chair in the corner of the living. Maybe it’s the workbench out in the garage. You could also consider the kitchen as your territory. Of course, the more people we live with the harder it is to find that special spot. Have you considered that you might actually have enough room if only you would clear out the clutter? That decluttering is easily taken care of with a call to Junk King Phoenix. Junk King Phoenix is it professional junk hauling service that is dedicated to giving you the home you always dreamt of. They’re not going to re-create your floor plan do any painting but what they can do is remove all the unwanted items you’ve got scattered around that house. By doing that, you’ll be able to reclaim a lot of space. It might just be taking back your closet from all that clutter. That can make a huge difference especially if you want to add to your wardrobe. It doesn’t make sense to hold the clothing that you’re never going to wear again. It could be that you have a spare room that has been turned into a dumping ground for your family’s unwanted clutter. Usually that starts when you are scrambling to clean the house when company is heading. Things get shoved into a spare bedroom and left there. Out of sight, out of mind, right? What it looked like if Junk King Phoenix were to come in and take away all that clutter? You be able to reclaim that room and make it your own space. Maybe it will help separate siblings so they have their own bedroom. Maybe you’re looking for quite space for a yoga studio. There really is no limit to what you can do with an empty room! All the things that you’re getting rid of our going to be sorted by the Junk King Phoenix crew. This is not a company that likes to dump things in a landfill and leave it at that. Instead they like to pull out items that they know could be repurposed at charities or recycling centers. This green way of getting rid of junk is the only wage junk King Phoenix operates. 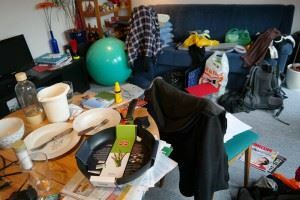 To make more room in your home start with a call to Junk King Phoenix and get ready to say goodbye to all that clutter. This entry was posted in Clear the Clutter and tagged Junk King, junk removal, room on December 27, 2016 by Dan Mijajlovic . Last updated August 9, 2017 .